Then ... After a long day of sightseeing Myra and Lester swing by his place to drop him off. As they climb the Hyde Street hill Alcatraz and Angel Island are seen in the distance in the north Bay. ... and Now, this is Hyde Street today from the junction at Lombard Street. The houses across the street were not built until the 1970s and 1980s, unlike those facing it which were built out before this movie was filmed. Then ... 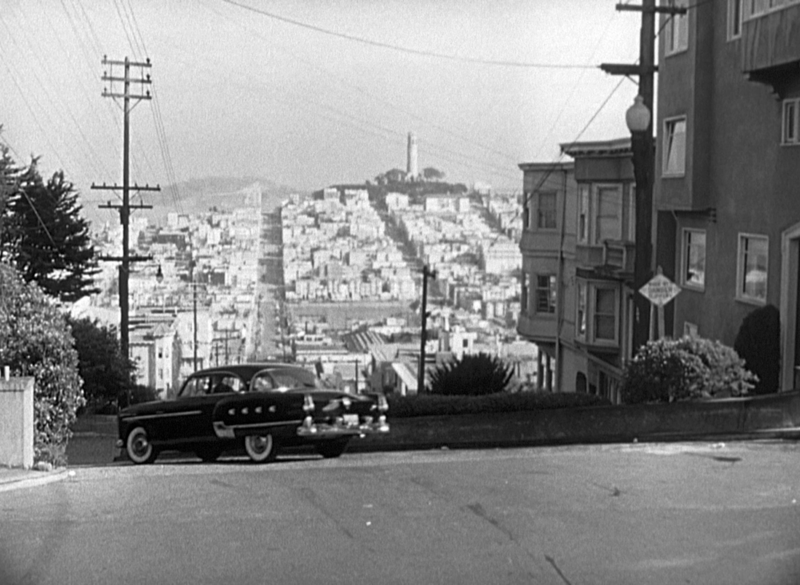 They swing down San Francisco's most famous block on Lombard, Russian Hill's crooked street, renowned for its grade, 27 degrees before being tamed to 16 degrees by eight switchbacks. (Some would and do argue that Vermont Street between 20th and 22nd on Potrero Hill is more crooked. While it has one less bend, it's steeper - so it depends on how you define 'crooked'). ... and Now, but this spot is the tourist's choice, in part thanks to its wonderful seasonal flower display and the magnificent vista of Telegraph Hill and Yerba Buena/Treasure Island. Passing cable cars stop here to take it in. Then ... At the third switchback from the top where Montclair tees in, Lester jumps out in front of his place, 1079 Lombard Street, the corner building behind them (map). (As steep as this block is, there are far steeper streets in the city, listed here). ... and Now, in this recent photo we see these houses have changed very little. Lester's place, as we shall see, was the top apartment, arrowed. Note the exterior remodel to the unit next door at far left. ... and Now, here's 1079 Lombard viewed from the bottom of the crooked block with the flowers in full bloom. The one-way tourist traffic is relentless and many of the homeowners on this block would like to see the city make it pedestrian only. In a later scene in Lester's room he hears Myra pulling up outside and looks down from the corner bay window. Then ... below his window he sees her car parked just above the fourth switchback. ... and Now, his glance looked across the first parking space down to the next one where Myra had parked. She gets out of her car, pausing to look up to Lester's window. She goes to his room but finds him with suitcase packed, about to leave town (it's a ploy to reel her in). When, distraught, she begs him to stay, he knows she's his.